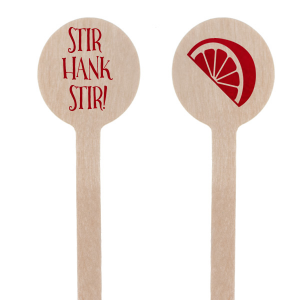 Dress up your celebratory cocktail with custom round retirement stir sticks! 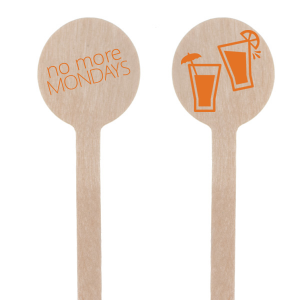 Personalize your custom retirement swizzle sticks with a phrase like "No more Mondays!" or "Congratulations!" Explore our many design or create your own! A well deserved cocktail is the first one you have after retirement, so dress it up with personalized retirement swizzle sticks. You're retiring! Add a splash of personalization to your first of many boozy beverages with these custom retirement party round stir sticks. These cute and customized wooden swizzle sticks are the perfect way to celebrate the end of you career by sticking them in a drink or throwing them in some appetizers. Your retirement party is sure to be a hit if your custom designed retirement swizzle sticks are personalized with the retiree's name or a catchy phrase. Use one of our pre-made designs for your personalized retirement swizzle sticks or create one in our customizer that is unique and extra special. You can use extra customized retirement stir sticks to keep around the house so your guest can stir their coffee or cocktails in custom designed style. The possibilities are endless!